The two-day version of Present With Ease! provides a range of advanced presentation skills that participants can use for a lifetime of communication success. 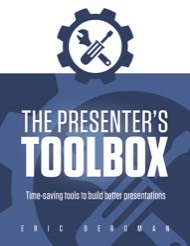 Using Eric Bergman’s proprietary content development approach in The Presenter’s Toolbox, participants gain clear understanding into developing effective presentation content. They gain deep insight into delivering that content in a relaxed, conversational style that makes it easy for the audience to understand, retain and apply the ideas delivered. Prior to the workshop, participants complete seven short tasks (the second of which can be found here) to shape their thinking. They use this pre-work to develop clear, concise content for a five-minute presentation that they deliver during the afternoon of the first day. They expand their content for day two, when they deliver their presentation twice, use visual aids effectively, answer questions from the audience, and finish on time. By the end of the second day, participants gain a set of tools they can use to develop compelling content, and insight to help them deliver that content effectively. The gain insight into using presentation visuals as aids, not crutches. They learn the value of answering questions clearly and concisely to enhance interaction, engagement and understanding. Most of all, they gain awareness into how to have audiences leaning in to listen, not tuning out to text. Contact Eric if you’d like to develop a workshop that’s right for your team. Delivering “the drill” with set text (a role-playing exercise that is interactive and instructive to illustrate important principles of face-to-face communication). Recognizing that, to be effective, delivery must be two-way, receiver-driven and natural. Using models and processes to match message to the needs, wants and desires of the audience. Applying a series of proven models to develop focused content, while saving time. Striking a balance between a full sentences and no sentences (ad-lib). Using structure to stay on time and on track, but not projecting that structure to the audience. Participants eat lunch while finishing the content of their short three- to five-minute presentations. Participants deliver their short presentations and are videotaped. Segments of each presentation are played back. Issues specific to the presenter (yet common to all) are discussed. Areas of improvement are suggested. Examining principles of using visual aids — i.e. is it possible for audiences to read and listen at the same time? Relating “the medium is the message” to face-to-face communication. Using presentation visuals as an aid, not a crutch. Participants are encouraged to apply what they learned to what they do—not only during group presentations but also one-on-one. Participants receive their two-part homework assignment. The first part is to rework their three- to five-minute presentation, based on earlier feedback, and be prepared to answer questions at the end of the presentation. The second is to expand this presentation to 7 to 10 minutes, include at least two visual aids, be prepared to answer questions throughout, and finish on time (maximum 20 minutes). A review of day one is conducted with a short interactive oral quiz. Principles of answering questions effectively are covered. Participants are videotaped while delivering their short presentations, and during a Q&A at the end. Issues specific to the presenter (yet common to all) are discussed, and possible improvements are suggested. Participants are given one last opportunity to make final changes to their longer presentations. Participants deliver their 7- to 10-minute presentation, answering questions from the floor throughout. They must deliver their message, answer every question, and finish within a set time limit (usually 15 to 20 minutes). After a final review of the program, participants are encouraged to work together to keep improving their skills, and to call if they ever have questions in the future. “Early in my career Eric trained me in public speaking. Several times, as I have moved up in the financial planning business, I have referred my reps to him when they needed help with their presentation skills.